Learn ways to help keep your garden free of mosquitoes and fungus without using harmful chemicals. 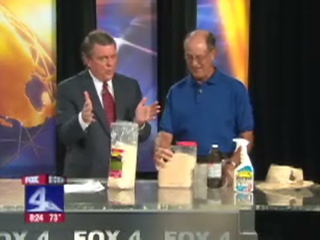 On a recent guest appearance, Howard showed Tim Ryan some easy recipes that work, are easy to use and save money. 1. Empty standing water where possible. Even small containers such as pot saucers, old tires, soda bottles and cans hold enough water for mosquito breeding. 2. Treat water that cannot be emptied with gambusia fish or (Bti - Bacillus thuringiensis ‘Israelensis’) products such as Bactimos Briquettes or Mosquito Dunks. 3. Spray to kill adult mosquitoes with plant oil pesticides such as Bioganics and Eco-EXEMPT. Garlic sprays also work well to repel the insects for up to 30 days. Even better, broadcast dry granulated garlic to the site at 1-2 lbs. per 1000 sq. ft. Dr. T’s Mosquito Repellent is a commercially available dry product. 4. Use organic landscape management to encourage birds, bats, fish, dragonflies and other beneficial insects. 5. Use skin repellents that contain natural repellent herbs such as aloe vera, eucalyptus, tea tree oil, lavender, vanilla, citronella and other helpful herbs. The Center for Disease Control now recommends lemon eucalyptus. DEET products should not be used, especially on children – as is stated on the label. A recommended safe product is Cactus Juice.